Marine art by Gordon Frickers 50 x 81 cms (20″ x 32″), oils, original commissioned by and sold to British Telecom (Marine) Ltd.
British Telecom Marine commissioned 2 paintings, one for the boardroom, one for presentation to Coe Metcalf for the excellent work, completed in budget & on time. The Cable Ship ‘Nexus’, originally an oil drilling ship was converted at Birkenhead by Coe Metcalf working at the famous Cammell Laird shipyard, on the Mersey at Birkenhead opposite Liverpool. The chairman and chief executive of BT Marine, Captain John Simkins, took Gordon Frickers to Birkenhead to inspect the ship and the river Mersey. The artist then worked closely with the Coe Metcalf design office. The result includes many fine details, note the ferry across the ‘cross the Mersey’ and on the Liverpool shore the street were Coe Metcalf had their offices. The composition and the quality of your painting is quite simply stunning and has deeply impressed everyone who has seen it. The detail, lighting and colours deserve particular attention; the inclusion of another CMS vessel in the background is a delightful touch as is the choice of venue. T.C. 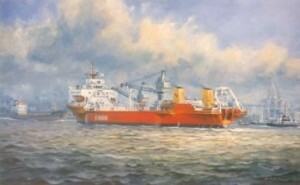 Hart, Managing Director of Coe Metcalf Shipping Ltd.
Gordon Frickers also commissioned to produce a set of cards for Christmas and as a superior with compliments card of this marine painting.